Fishing: salmon, native brook trout, sea trout in river. Stripe bass in salt water. 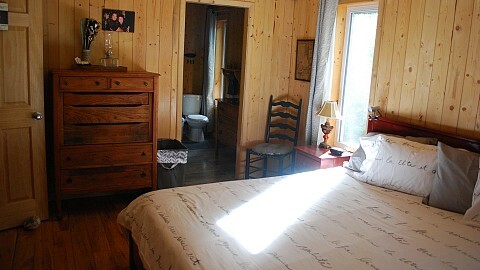 Stay in a beautifull lodge in the magnificent Matapédia river valley. Matapédia River Lodge, buit in 2011, is entirely made of local wood, which gives a appeling rustic charm. We offer 5 rooms that can accommodate 2 to 4 guest with 3 shared bathrooms and one room with a private bathroom and private access to the terrasse. This terrasse (with tables and chairs) offers an breath taking view on the river and the Appalachian mountains but also, you can observe many hummingbirds feeding in our feeders near you. Breakfast are included in our prices and we offer many different types of plans : B&B, american and european. Every night an (3 services) table d’hôte is offered (on reservation), which allows you to meet friendly people and share on your day activities and discoveries. Visit the small fishermen village, see anglers fishing for salmon, the old train station and admire the covered bridge. You are looking for tranquility? 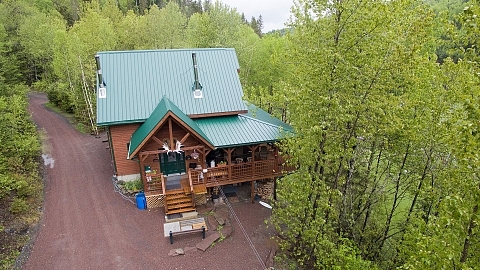 Our lodge is located in the wilderness, far from the city! Welcome to salmon and moose kingdom! 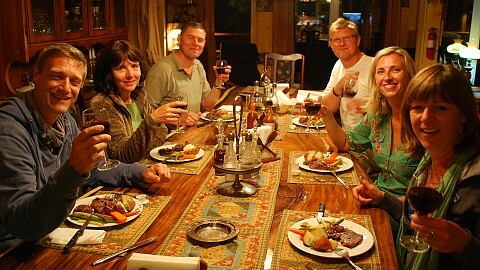 We offer many activities from the lodge, with or without packages. Our speciality is without a doubt, salmon fishing and moose hunting, but we also offer an array of guided and non guided activities. Please see our rates on our website. Winter season: January 15 to March 20, 2019 - Summer season: June 1 to October 30, 2019.